Seeing as it is Halloween soon I thought that it would be fitting to give another list of, what I consider, to be great horror films. Watch these on your Halloween night and it is sure to be an enjoyable, yet terrifying one. This list compiles horror films from a wide range in the genre, so it is likely that it will contain something that will give your spine a shiver. Where would horror be today if Alfred Hitchcock had not decided to take on directorial duties? Thankfully we don’t have ponder that question, as he created many masterpieces in his time; including the film which will have inspired many horror directors after him, Psycho. Anthony Perkins takes on the role of the infamous Norman Bates, a lonely motel owner who is slightly too attached to his eerie mother. When beautiful women check into Bates’ motel, they don’t usually check out. Perkins gives a stellar performance here, as he convinces the audience that underneath that shy persona a psychopathic mentality lurks, just waiting to strike at his next available victim. 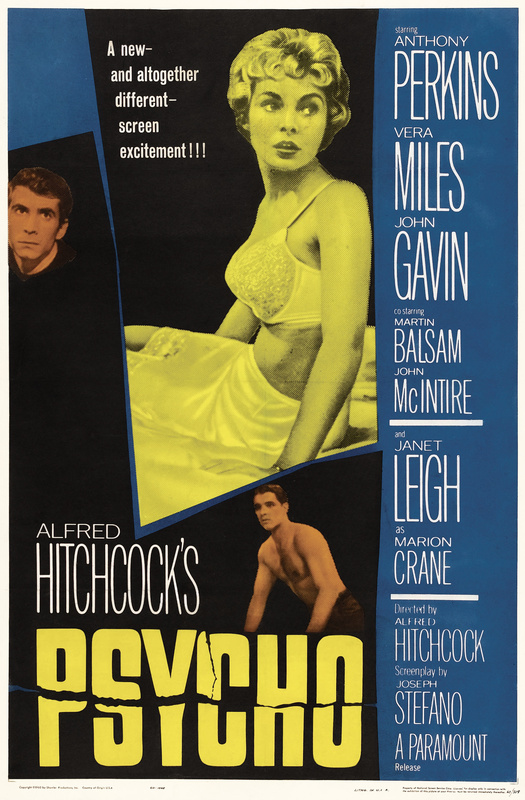 Psycho is a complete classic all round, will probably be in most horror fans film collections and contains one of the most famous shower scenes in cinema history. Janet Leigh never saw that knife coming. 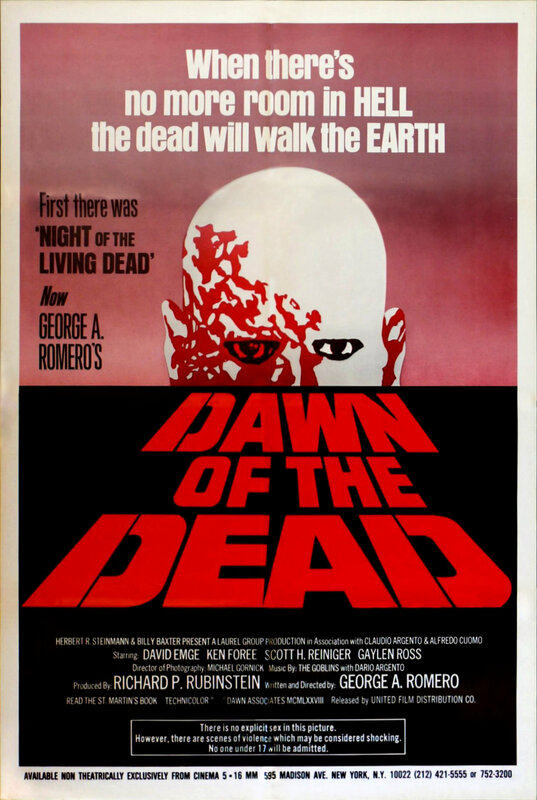 The second in the Godfather of Gore, George A. Romero’s, dead trilogy; and predecessor to the film which shaped zombie films today, Night of the Living Dead. Where the first in the trilogy introduced us to these flesh-eating ghouls, Dawn of the Dead was much more character driven and the make-up effects were just spectacular, even though most of the undead did appear blue. Zombies have already risen and two soldiers, with a helicopter pilot and his girlfriend team up to secure a mall to wait out the on coming hoards. From beginning to end this film is enjoyable, not only does it have great a story, characters and make-up but it also brings that creepy 70s vintage film vibe that adds a lot to the atmosphere. The demonic low-budget horror film which, along with its two sequels, has become one of the biggest films in the cult arena. 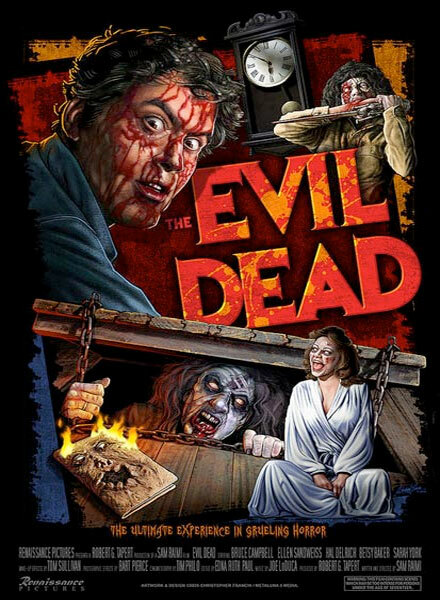 B-Movie superstar Bruce Campbell stars as Ashley ‘Ash’ Williams, as he, his girlfriend and their three friends travel to a cabin in the woods for a night of debauchery. Unfortunately the festivities are cut short as one of the members of the group reads from the Necronomicon; an ancient evil book that is bound in human flesh and written in human blood. From that moment on a demonic force is released and goes on to take control of the various members of the group, forcing them to try to kill their friends. Buckets of blood, amazing make-up that will turn your stomach and cheesy one-liners make this a film one that you will never forget. Oh, and there’s the tree scene, no explanation needed…just watch it. Master of horror John Carpenter has given us some amazing flicks over the years; such as Halloween in 1978 and The Fog in 1980. 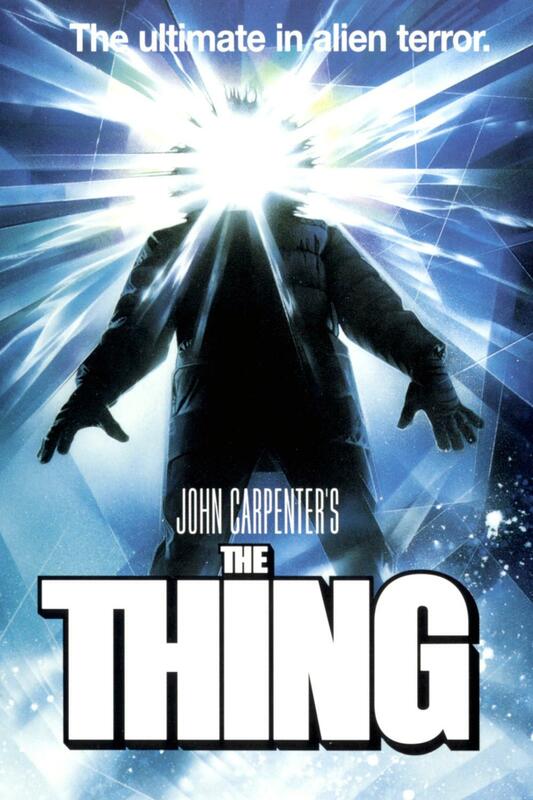 However, there is one film from this director that was leaps and bounds above what anyone expected it to be – The Thing. Based on the novella Who Goes There? by John W. Campbell Jr., the plot is that a crew working out in Antarctica find an odd frozen creature at a Norwegian outpost, after they take it back with them and it thaws out it takes the form of any person it can come into contact with. The audience, along with the characters, never know who truly is the alien and who isn’t; you find out quite suddenly though when it starts attacking you as its body morph into all kinds of nasty creatures. The Thing is praised for having effects which were way ahead of its time, and also one of the most suspenseful blood testing scenes ever. This British horror from Neil Marshall really gives you that feeling of claustrophobia, as six women decide to take a trip caving and get trapped underground. What they don’t know is that this particular cave just so happens to house flesh-eating humanoids; creatures who have adapted to the dark and will tear at and eat any fresh meat they can find. 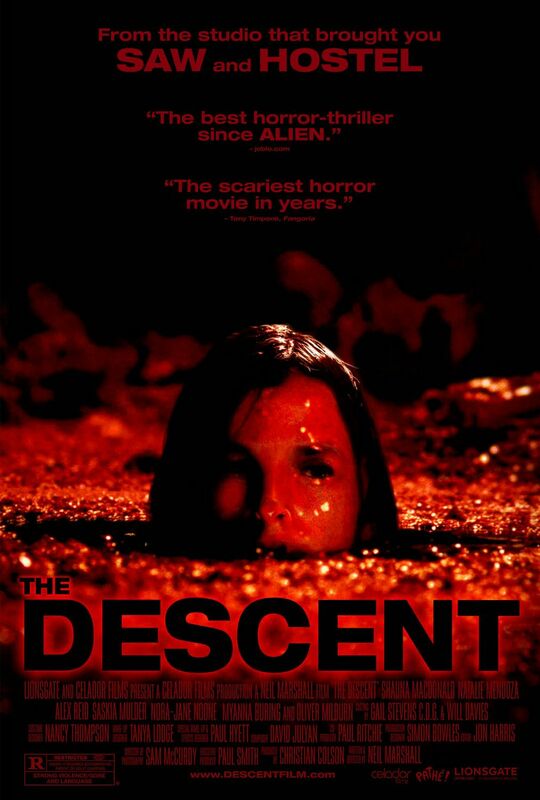 The Descent plays on the creepy vibe so well, firstly by making you feel trapped in the caves with the characters, but even before the cave-in as it casually shows you the creatures lurking in the distance. The scene that makes this one of my favourites though is after the girls realise the trouble they are in, in the dark one of the group puts on the night-vision camera, and as we look through it a scare happens which I have never forgotten; no matter how many times I’ve watched it. Before watching Apocalyptic I was rather excited. Mainly because when reading about it, viewers had said that it was very similar to, arguably, the best segment in the entire V/H/S film franchise: ‘Safe Haven’, wherein a camera crew enter the temple of an Indonesian cult, and instead of filming an intriguing documentary they are left fighting for their lives. The idea of that story being made into a film, in my opinion, was such a great concept. The Australian film directed by Glenn Triggs starts off well, although it is yet another hand-held camera movie – the actors aren’t trying too hard to make it look realistic. It instead comes across, at the beginning, as a documentary about individuals trying to cope with their drug and alcohol problems. This is where the story begins, as our protagonists Jodie and Kevin are allowed to record inside a help group meeting where they meet Bradley, a man who claims to have been living with a dangerous cult who follows the mysterious Michael Godson. Of course the idea of a cult living in the Australian Bush is a much more gripping story for this reporter and her cameraman, so they decide to follow the directions from their only lead. Upon arriving at their destination they are greeted by two of the group’s members, a woman and a child, who lead them to their secret home in the woods. Although there is an eerie vibe surrounding the group, mainly because of the group’s creepy leader Michael Godson and the fact that there are no other men present, they don’t seem threatening. As the days go by, the group’s characteristics never falter, but various pieces of information about their overall plan is beginning to come to light, as things are discovered in the woods and the women talk about their plans for the approaching apocalypse. The tall, strange leader appears to have such an influence over his followers that they will follow his every word. This at first does not seem so terrible, but steadily the group start to harm each other in horrific ways. As the final night approaches and Michael’s plans for his group are revealed, will the crew give in like the others or attempt to right the wrong which is being done here? Horror and thriller films which centre around cults are a great love of mine, mainly because it combines two of my greatest fears together; cults and small spaces. What films such as this do is create a feeling of claustrophobia within the audience, as we are, usually, taken into a compound that is cut off from the rest of the world and are surrounded by people who will do anything that their leader tells them. Therefore you feel trapped in this place, unable to leave, and just waiting for the followers to close in on you. 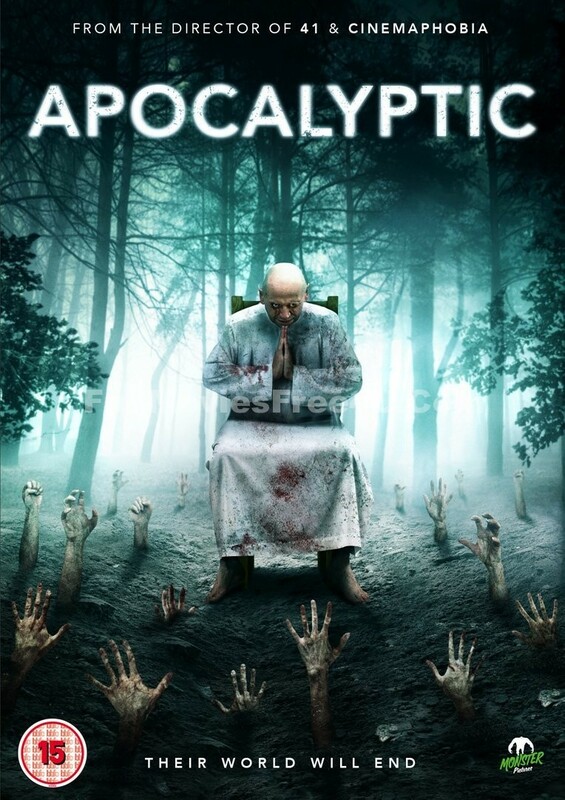 Apocalyptic creates this feeling due to the film being set in the Australian woodland; the characters are cut off from the rest of the world, and the only people who can lead them to safety are the cult members. While I am glad that I watched this film, it did slightly disappoint. It was not an awful film, but after being compared to Safe Haven of V/H/S 2 it seemed like it was missing so much. Maybe because it was compared with that film I had such high hopes, and when these were not met the film felt like it was lacking something. The plot was great, the characters kept you gripped, but then came the ending. It is an ending that seems to have really destroyed the found-footage horror genre; an unsatisfying one. I for one love this style of film, but over the past few years these types of film (Paranormal Activity/The Last Exorcism/The Devil Inside) have consistently created great build ups to displeasing conclusions, and you are left with quite a few questions that need answering. Apocalyptic is no exception; throughout the film it draws you in to the mystery of what is really going on with this group, and then just when the horror kicks off it finishes, leaving lots of loose ends. One of which being why did these people follow Michael Godson – David Macrae gives a great portrayal of the leader, whose distinctive features only add more to this creepy character, however we are never really given a reason to how he has brainwashed his followers, and he does not come across as someone who has such a strong personality to make people believe whatever he comes out with. This film is worth a watch, however do not go in to it with high hopes as it is more of a film to just pass the time. Tag Line: Their World Will End.